At Healthy Holistic Living we search the web for great health content to share with you. This article is shared with permission from our friends at Mercola.com. Nails are often regarded as a purely aesthetic feature, and the $768 million spent annually on nail polish (in the U.S. alone) can attest to that.1 Yet, your nails are far more than a platform for bright colors and nail art. If you notice any significant changes in your nails, including swelling, discolorations, or changes in shape or thickness, see a dermatologist right away. It could be nothing, or it could be due to an underlying condition (for instance, nail problems are more common in people with diabetes). Below are 10 nail symptoms you might experience in your lifetime and what they mean for your health. Your nails may yellow with age or due to the use of acrylic nails or nail polish. Smoking can also stain nails a yellowish hue. If your nails are thick, crumbly, and yellow, a fungal infection could be to blame. Less often, yellow nails may be related to thyroid disease, diabetes, psoriasis, or respiratory disease (such as chronic bronchitis). Clubbing describes when your fingertips become enlarged and the nail becomes curved downward. It can be a sign of low oxygen in your blood and is associated with lung disease. Clubbing can also be related to liver or kidney disease, heart disease, inflammatory bowel disease, and AIDS. Small white spots on your nails are usually the result of nail trauma. They’re not cause for concern and will fade or grow out on their own. Less commonly, white spots that do not go away could be due to a fungal infection. Horizontal ridges, also known as Beau’s lines, may also be due to psoriasis, uncontrolled diabetes, circulatory disease, or severe zinc deficiency. Another type of horizontal line is known as Mees’ lines, which are horizontal discolorations that may be due to arsenic poisoning, Hodgkin’s disease, malaria, leprosy, or carbon monoxide poisoning. Vertical ridges are typically a normal sign of aging and are not a cause for concern. They may become more prominent as you get older. In some cases, nail ridges may be de to nutrient deficiencies, including vitamin B12 and magnesium. Nails that curve upward at the edges, taking on a spoon-like appearance, may be a sign of iron-deficiency anemia, hemochromatosis (excess iron absorption), heart disease, or hypothyroidism. If your nails have multiple pits or dents, it’s often a sign of psoriasis. 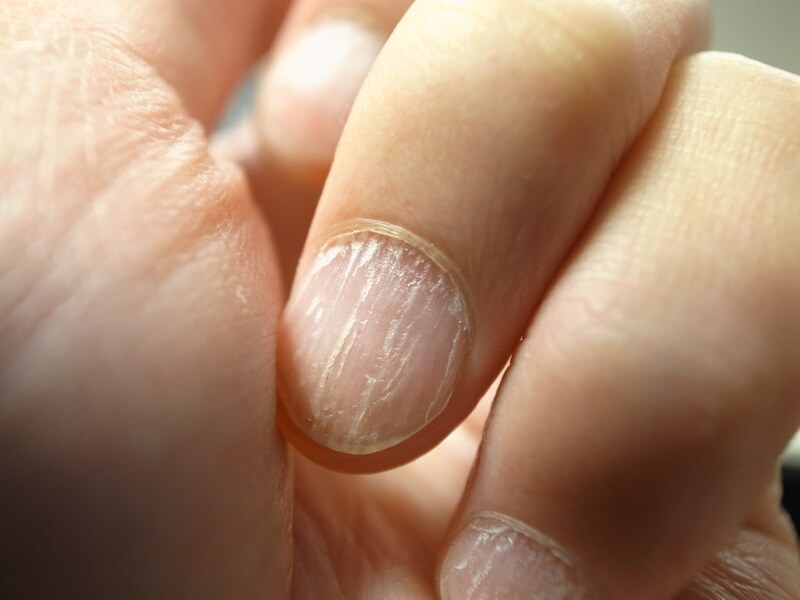 Nail pitting may also be due to connective tissue disorders (including Reiter’s syndrome) or alopecia areata, an autoimmune disease that causes hair loss. Black streaks or painful growths on your nail warrant an immediate trip to your physician, as they may be due to melanoma, the deadliest form of skin cancer. If your nails are mostly white with a narrow pink strip at the top, known as Terry’s nails, it could be a sign of liver disease, congestive heart failure, kidney failure, or diabetes. Sometimes Terry’s nails may also be due to aging. Most nail symptoms are due to systemic issues, trauma, or lifestyle factors, and this includes the habit of nail biting. Nail biters are susceptible to paronychia, a skin infection that occurs around your nails. As you chew your nails, bacteria, yeast, and other microorganisms can enter through tiny tears or abrasions, leading to swelling, redness, and pus around your nail. If you eat a balanced, whole-food diet like the one described in my nutrition plan, you’re probably giving your body more-than-adequate amounts of the vitamins and minerals it needs to function. If not (and this applies to the majority of the U.S. population), there’s a good chance your body is lacking in important nutrients. Not only can this lead to chronic diseases, but your nail (and hair and skin) health will also suffer. Healthy sources of protein, like whey protein, free-range eggs, and grass-fed meat, are important (grass-fed beef is also a good source of zinc, which is necessary for making proteins like those found in your nails). Antioxidants, vitamins, and minerals found in leafy greens, berries, and other whole foods will also benefit your nail health. Biotin, vitamin B7, is one example. Your body needs biotin for metabolizing fats, carbohydrates, and amino acids, but it’s most well known for its role in strengthening your hair and nails. Biotin may play a role in building keratin, which makes up your nails. Egg yolks from organic, free-range eggs are one of the best sources of biotin. Animal-based omega-3 fats are also important. Most Americans eat too many inflammatory omega-6 fats (think vegetables oils) and too few anti-inflammatory omega-3s, setting the stage for health problems like depression, heart disease, rheumatoid arthritis, and diabetes, just to name a few. Inflammation may also interfere with nail development. The ideal ratio of omega-3 to omega-6 fats is 1:1, but the typical Western diet is between 1:20 and 1:50. Brittle or soft nails are a common signs that your omega-3 to omega-6 ratio may be out of balance. Try cutting back on vegetable oils and eating more animal-based omega-3s from krill oil, sardines, or anchovies. Nurturing your nails from the inside out via the proper diet described above is important, but so is protecting your nails from excessive exposure to water or chemicals. Cotton-lined rubber gloves are useful when doing dishes, for example, and minimize (or eliminate) your use of nail polish, polish remover, and artificial nails. Simple buffing can create a nice, smooth sheen to your nails, without using any nail polish whatsoever. An added boon is that it may actually help your nails grow stronger and longer due to increased circulation, and you won’t have to worry about chipped nail polish either. Finally, if you notice any unusual or bothersome nail symptoms, resist the urge to simply cover them up with artificial nails or manicures and pedicures. Instead, see a holistic health care provider who can help you figure out if there’s an underlying issue.